Amanda Coogan, ‘I’ll sing you a song from around the town’ at LCGA. Photography by Eamonn O’Mahony. Writing on Irish art is in many ways about navigating the gaps in the readily available information, its sporadic and uneven construction through partial Wikipedia entries, old CIRCA scans, unsourced blogs, forgotten Facebook posts, the occasional Irish Times review or the unexpected ‘pop-up’ publications. 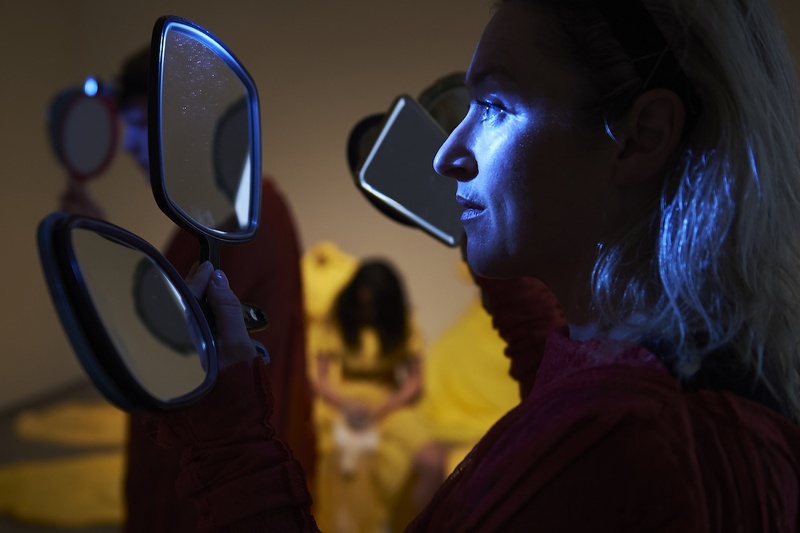 I had abandoned my plans to write about Amanda Coogan’s solo exhibition at the Limerick City Gallery of Art – I hadn’t seen the original showing of ‘I’ll sing you from around the town’ at the RHA in 2015, and was unable to attend the performances at LCGA. But looking over my notes, it was the prevalence of documents of previous performances which brought my attention to it again. The sheer abundance of text, photographs and video alongside Coogan’s classic projects – such as the ‘Yellow Series’ – that carry the weight of previous iterations, previous manifestations and exhibitions, points again and again to the edges, to what lies around and beyond the event, object or document that is present, with the lived, durational moments of the performance and exhibition serving to heighten the intensity of these edges. This is especially relevant for 24 Hours in the Museum, for which Coogan spent 24 hours in the Museum of Fine Arts, Boston. Each hour has a brief description, referencing the visitor flow, recalling anecdotes and Coogan’s own physical and mental fatigue. More so than anything, 24 Hours in the Museum offered an experience the audience would likely be unable to witness in its totality, bringing the periphery of the performance into focus. Beyond the durational struggle of the artist, it becomes about the presence and absence of others, those who waited for something to happen, those who drifted past without realising what was going on, those taking photographs, trying to interact with the artist, and even those not documented, who went home, posted about it on social media, and gossiped in the pub afterwards. The emergence of digital contexts amplifies these considerations for artists, generally intensifying the social pressure for photography and text, accelerating the attention economy surrounding artists, and producing new audiences and often overlooked forms of engagement. Yet, the attention economy always leaves its trace, and the emergence of digital tools for recording and distributing is nothing new. There has always been word of mouth, Chinese whispers, first-hand accounts distorted or embellished over time through memory and so on – all this exists at the edge of the photograph, beyond the text, rippling outwards from the exhibition and event, the objects and performances. Amanda Coogan’s ‘I’ll sing you a song from around the town’, at the Limerick City Gallery of Art, 24 November 2016 – 29 January 2017.